The Quantified Self Europe presentation videos are now online. Enjoy! This entry was posted in News and tagged body blogs, moodscope, quantified self on February 13, 2012 by Kiel Gilleade. I recorded my heart rate using the body blogging system and my daily mood using Moodscope for three months in 2011. I wrote about the aim of this project and some intermediary experiences in previous blogs and would now like to talk about my final impressions and what I learned from combining the two systems. I presented these results at the Quantified Self Conference in Amsterdam in November 2011. This entry was posted in Musings and tagged body blogs, Heat Maps, mood, moodscope, quantified self on January 20, 2012 by Ute Kreplin. At the beginning of the year I proposed to track my mood via Moodscope (subjective measure) while body blogging (physiological measure), what follows is my initial impressions so far in using these technologies before presenting my conclusions at the Quantified Self Conference in Amsterdam in November. This entry was posted in Musings and tagged body blogs, mood, moodscope, PANAS on October 21, 2011 by Ute Kreplin. 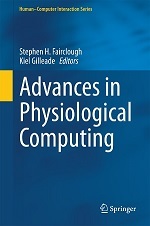 Admin: Please welcome to the site our new Physiological Computing blogger. My name is Ute Kreplin and I am a new PhD student at Liverpool John Moores University under the supervision of Dr Steven Fairclough. My PhD research topic is on Neuroaesthetics with a focus on “interest” in the aesthetic experience and its psychophysiological underpinnings. I am also very interested in positive psychology, which I am pursuing through studies at the University of East London. I am combining my interest in positive psychology and physiological computing in this blog, which will hopefully be my first of many. This entry was posted in Musings and tagged body blogs, mood, moodscope, PANAS on May 19, 2011 by Ute Kreplin.